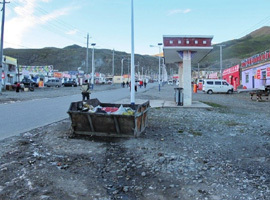 Pulan County, a region in the south west corner of the Tibet Autonomous Region, China, is feeling the growing impact of tourism as it serves as the gateway to Mount Kailash and Lake Mansarovar. Tourism is a reliable source of income for the local community, on the one hand, but it is also rapidly changing their traditional landscape and surroundings on the other. Infrastructure development and new challenges accompany tourists, and the high and rising amount of waste that needs to be accommodated properly is a large challenge. Additionally, the absence of functional sanitation systems as well as sanitation standards has become more apparent and harmful – for humans and the environment – with the increasing number of visitors. 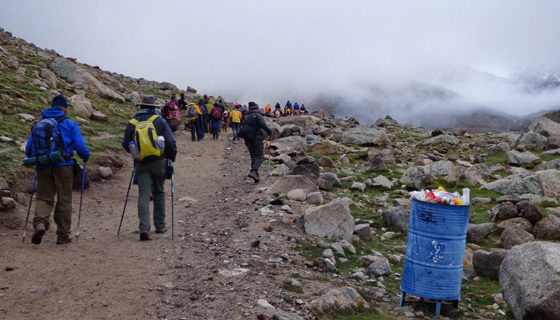 So, how can the local approach towards sanitation and waste be improved, both to benefit the living standard of the local communities, and to preserve the Kailash Sacred Landscape as an attractive tourist destination? The Kailash Sacred Landscape Conservation and Development Initiative (KSLCDI) has implemented different measures aimed at supporting local communities to handle waste and sanitation issues in Pulan County. Activities have ranged from raising awareness of local communities and visiting tourists on environmental protection and supporting the development of a waste management system, to offering trainings on various related topics, e.g. the introduction of the community led total sanitation (CLTS) approach. In the summer of 2016 (right), the impact of the efforts of the local waste management groups, and the rules of behaviour set by the local population is clearly visible in comparison to the situation in 2014 (left). As a result, sanitation standards have been enhanced through community efforts. As Soma, a tea-house owner from Hoer Township, proudly says, “I saw how much room there was for improvement in my surroundings. I worked on general cleanliness and built my own toilet, using my experience and what I had learnt in the CLTS workshop.” Furthermore, the government also took actions to improve the situation, after increasing their awareness through an exposure trip to Chengdu, Mainland China, and catering to the demand of the local population: “From the perspective of facility, right now, we have 15 public toilets and an open dam ditch built by the government,” Soma adds. The local community maintains these sanitation facilities and also came up with rules of conduct regarding their use. 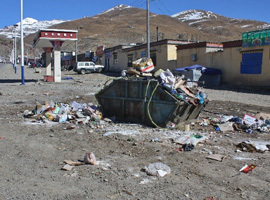 Besides the improvements in sanitation, changes are apparent in waste management as well. Waste management groups and garbage treatment companies have been set up in different townships, and proper rules of behaviour have been written up for dealing with waste. As with sanitation, the local communities, with support of the township governments, have taken up responsibilities themselves. “The village leaders are responsible. But we, the villagers, decide on the new rules,” says a resident from Xiongba village, near lake Mansarovar. With such motivation and engagement, waste and sanitation management as well as the protection of their environment is sustainably driven by the community, and will be consolidated in the long term and for future generations. The Kailash Sacred Landscape Conservation and Development Initiative (KSLCDI), in cooperation with Sichuan University, China, started working with the local community on tourism development in Pulan County in 2012. Its activities are supported by UK Aid from the Department for International Development (DFID), and the German Federal Ministry for Economic Cooperation and Development (BMZ) through the Deutsche Gesellschaft für Internationale Zusammenarbeit (GIZ) GmbH.